Judith and Holofernes by Emile-Jean-Horace Vernet, Part 20 of the Introduction to Art and Artists of Our Time. From the picture by Emile-Jean-Horace Vernet. EMILE-JEAN-HORACE VERNET has been already mentioned among the French military painters. He was born is Paris, in 1789, in the Louvre, where his parents had an apartment, and he died so late as 1863. His grandfather, Joseph Vernet, was a marine-painter of distinction in his time, although his works are long out-grown, but he did something, perhaps, to break the spell of the old classic formulas, and thus entitled his work to respectful consideration. Horace Vernet was for a long time one of the most popular artists in France; he held the place he had gained when he was but a youth, by the lavish way in which he put his art at the service of the French love of military glory, since the greater part of his five hundred pictures are the record of French victories and triumphs. The battles of Napoleon, the conquest of Algiers, gave him subjects in plenty, and the long galleries at Versailles, filled with the fulsome record of these wars, are known to weariness by the visitors whose feet have tramped through them. All that gives Vernet a right to be remembered is the fact that he was one of the first to put into his battle-pieces something of that life which we of to-day recognize and applaud in the pictures of the men whom we count among the true battle painters. But his art was in itself superficial and uninteresting, and the contents of his pictures more superficial and uninteresting still, and the picture we have selected to illustrate our note is perhaps the only one that retains any hold upon the public that does not care for the military triumphs of France. Another picture, "Rebecca at the Well" has also been engraved and long enjoyed a certain popularity. Both the "Judith about to slay Holofernes" and the "Rebecca" were painted in Algiers, where Vernet had joined the French army. The "Rebecca" was one of the first pictures painted in our times, in which the idea was embodied, that since the manners and customs of the East have remained with little change down to our own day, the people of the Bible may properly be represented dressed in the Oriental costumes of the present time. 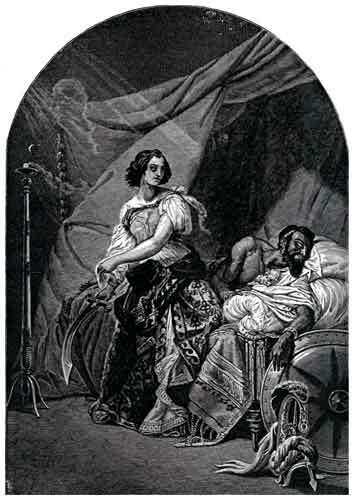 The suggestion of the "Judith" grew naturally enough out of the new familiarity with things of the East, with stuffs and rugs, and arms and armor, and with the dark-skinned people themselves, since all that the ordinary artist asks for his picture is a subject on which he can utilize the "properties" he has at command. We may mention, in passing, that the original study of the head and bust of the model who sat for the Judith, was lately sold at auction here in New York, and, as often happens, it was, as a study, far more interesting than the head in the completed picture. The rise and growth of the Romantic school is a subject too large to be discussed within such limits as are here necessarily imposed upon us. Something, and perhaps sufficient for the purpose, has been said upon it in former pages of this work, in connection with various artists who belong in the ranks of the Romantics, so called because they displaced and superseded the classic school of painters. It is a movement as difficult to explain as the corresponding "sudden making of splendid names" in the reign of Elizabeth. We can study the signs in this new heaven, and enjoy their brilliant light, but the secret of their movements, the law of their rising and setting - for in our time they have indeed set - these things thus far remain unexplained, and we only amuse ourselves with theories. A few notes on three of the men who played a principal part in the development of the Romantic movement may fitly close this chapter.